The PSRF has been providing exciting field courses beginning in the spring of each year since the early 1990’s. The objective of our field course is to provide educational and instructive platform for students interested in conservation biology and environmental studies while at the same time providing able-bodied and enthusiastic personnel with which to conduct and facilitate our long term monitoring studies of sharks and rays of the Elkhorn Slough as well as pelagic species associated with the offshore Monterey marine canyons. 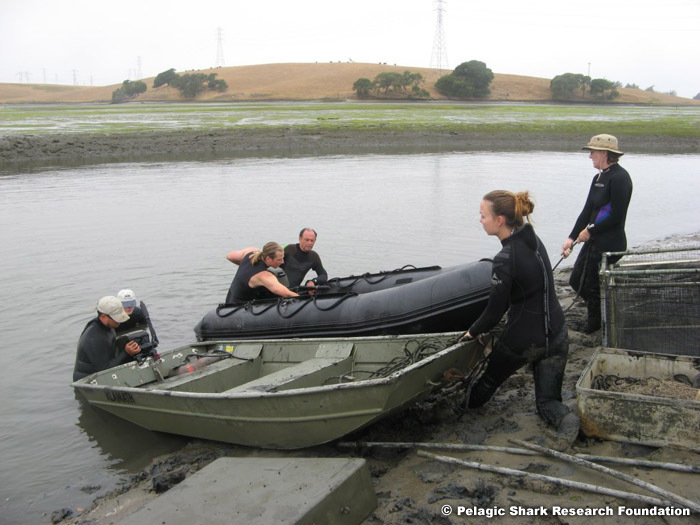 The field course provides practical, applied and experiencial training in the proper collecting and handling methods for mark and recapture research as well as sustaining long term monitoring study of shark and ray population within heavily impacted tidal marine estuary at Elkhorn Slough and peridic offshore surveys of highly migratory pelagic species. 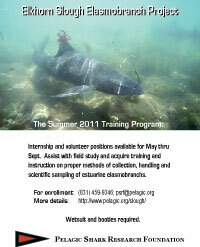 The Pelagic Shark Research Foundation draws its volunteer and staff roster from among students enrolled in field course. 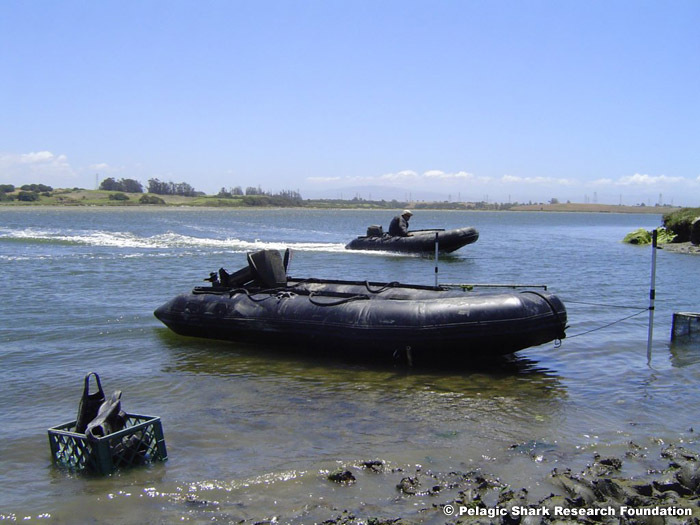 The principle focus of our PSRF Field Course is providing students a chance to participate in a long term study of estuarine sharks and rays (elasmobranchs) within the Elkhorn Slough National Estuarine Research Reserve (ESNERR) and other locations within the Elkhorn tidal estuary. 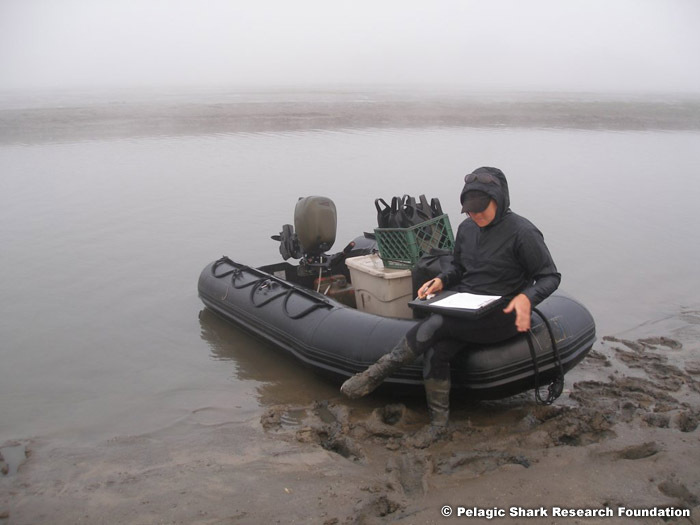 PSRF has been assessing elasmobranch populations within Elkhorn Slough since 1990. Elkhorn Slough has been identified as a breeding/pupping area for leopard sharks and shovelnosed guitar fish, bat rays and thornback skates. The study has detected and noted numerous changes to the Elkhorn Slough environment and habitats including increasing numbers of thornback skates. Elkhorn Slough experiences periods of expansion, brought on naturally by increased tidal flow. We are fortunate to be sampling during one of these periods, as such rare visitors to the slough such as a seven gill shark have been caught during surveys in main channel of the Elkhorn. Students who do well with field course are often invested in PSRF's periodic offshore surveys for highly migratory pelagic species of sharks tagged for mark and recapture study done over the deep waters of Monterey Bay marine canyon. These sorties are never dull and one such excursion resulted in the collection of a specimen of Architeuthis which was seen adrift among a large group of seabirds over 1200 feet of water. A blue shark tagged over marine canyon was later recorded to have been recaptured by a commercial long lining boat operating within 600 miles of Japan. Highly educational and instructive, this field course offers opportunity to study and protect inshore tidal marine estuary and explore and protect the open ocean environment while enrolled in a practical field course. 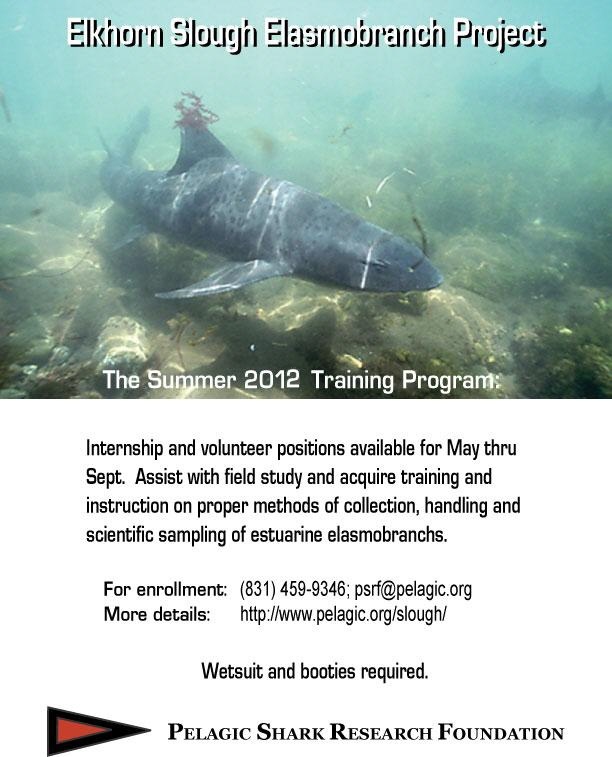 UC Summer internships are available via the UCSC Environmental Studies Program (internships).